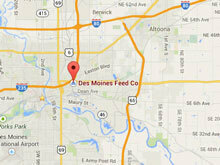 As Des Moines Feed Co. has grown, so has our knowledge. We’ve gained from our experiences, from our customers’ experiences (please share with us), and some from books. Are your wild birds wasting the feed you just bought on sale at a big-box store? Do you enjoy feeding the wild birds, but are concerned about the mess of sunflower shells under the feeder? Are the birds coming to your feeder and leaving without eating? Are you aware that, given a choice, birds and animals prefer non-GMO grains? 2,000 pound batch at one time. The feed will not mix correctly with the mixer. You can have clear or paper bags for your mix. The size of the bag depends on the ingredients listed. We can NOT make up 2,000 pounds and sell you 10 to store the rest. Our warehouse is at max capacity for floor stock items. Would you like help with how much grass seed to put down? Are you wondering which fertilizer is right for heavy clay soil? Maybe you are planning an ideal native grass and wildflower plot and need help to decide what works best. Perhaps you’ve started a mixture of a food plot blend and need the final “special” ingredient. Give us a call. 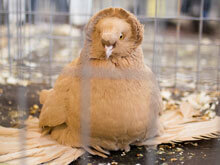 Or is it that you have four types of pigeon feed that you like and would prefer to purchase two blends? We can help with formulating the right blend for your loft. 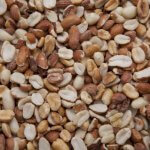 Do you have birds with smaller beaks and need a combination that doesn’t have such large grains in it? Is it that you live in a southern state and need a “cooler” formula? Or maybe a northern state and need a high energy formula. Give us a call. Did you know that having a rooster amongst your laying hens will reduce the cholesterol in the eggs? If your chickens are pecking each other, it could be that they are missing a vital nutrient. That can be easily remedied with adjusting your feed formulation, give us a call. We encourage everyone to sign up for Cardinal Chit-Chat Corner. Please provide your email address below. Thank you for looking at DMF for your feed and grain needs. To view pricing or place an order, please login below.